From before 1588, her married name became Villiers. [S6] G.E. Cokayne; with Vicary Gibbs, H.A. Doubleday, Geoffrey H. White, Duncan Warrand and Lord Howard de Walden, editors, The Complete Peerage of England, Scotland, Ireland, Great Britain and the United Kingdom, Extant, Extinct or Dormant, new ed., 13 volumes in 14 (1910-1959; reprint in 6 volumes, Gloucester, U.K.: Alan Sutton Publishing, 2000), volume II, page 229. Hereinafter cited as The Complete Peerage. [S6] G.E. Cokayne; with Vicary Gibbs, H.A. Doubleday, Geoffrey H. White, Duncan Warrand and Lord Howard de Walden, editors, The Complete Peerage of England, Scotland, Ireland, Great Britain and the United Kingdom, Extant, Extinct or Dormant, new ed., 13 volumes in 14 (1910-1959; reprint in 6 volumes, Gloucester, U.K.: Alan Sutton Publishing, 2000), volume II, page 67. Hereinafter cited as The Complete Peerage. [S15] George Edward Cokayne, editor, The Complete Baronetage, 5 volumes (no date (c. 1900); reprint, Gloucester, U.K.: Alan Sutton Publishing, 1983), volume III, page 202. Hereinafter cited as The Complete Baronetage. From before 1609, her married name became Boteler. [S6] Cokayne, and others, The Complete Peerage, volume II, page 230. From before 1600, her married name became Villiers. Her married name became Rayner. From after October 1606, her married name became Compton.1 She was created 1st Countess of Buckingham [England] on 1 July 1618, for life.1 Her last will was dated from 12 April 1631 to 4 April 1632. [S6] G.E. Cokayne; with Vicary Gibbs, H.A. Doubleday, Geoffrey H. White, Duncan Warrand and Lord Howard de Walden, editors, The Complete Peerage of England, Scotland, Ireland, Great Britain and the United Kingdom, Extant, Extinct or Dormant, new ed., 13 volumes in 14 (1910-1959; reprint in 6 volumes, Gloucester, U.K.: Alan Sutton Publishing, 2000), volume II, page 392. Hereinafter cited as The Complete Peerage. [S6] G.E. Cokayne; with Vicary Gibbs, H.A. Doubleday, Geoffrey H. White, Duncan Warrand and Lord Howard de Walden, editors, The Complete Peerage of England, Scotland, Ireland, Great Britain and the United Kingdom, Extant, Extinct or Dormant, new ed., 13 volumes in 14 (1910-1959; reprint in 6 volumes, Gloucester, U.K.: Alan Sutton Publishing, 2000), volume VI, page 262. Hereinafter cited as The Complete Peerage. 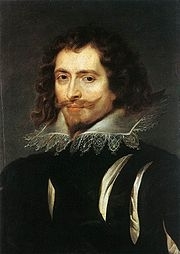 Rebecca Roper married Sir George Villiers, son of William Villiers and Coletta Clarke, before 1605. From before 1605, her married name became Villiers.